We were planning on making a Coca-Cola cake for Dad's birthday. Everyone that knows our Dad knows he loves Coke. He drinks it everyday instead of coffee. Coke was big in our house growing up. 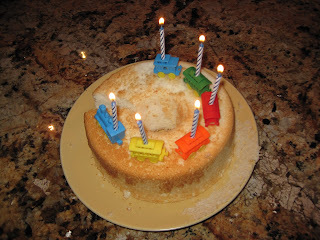 But last week when we were eating our Meatloaf, he suggested Angel Food Cake. He talked about how his Mom used to make it and how hard it was, but he loved it and how she switched to box mixes after she discovered them. All we heard was "Challenge!" We went with Alton Brown's recipe which can be found here. The recipe calls for "orange extract or extract of your choice," we chose Almond and it went downhill from there. Ok, not really but it didn't go perfectly either. The recipe calls for 12 egg whites. To get 12 egg whites, one must separate 12 eggs. 12 eggs is a lot. We aren't that experienced. You would think that we could at least crack an egg sufficiently but to make a long story short, using all 14 eggs in the fridge, our angel food cake had approximately 11 egg whites. From there, there's a lot of whipping to do. We whipped till we couldn't whip anymore (about 2 minutes) and then we mixed. We mixed the sugar in as directed but did not "achieve medium peaks" as directed. As you can see from the picture, there were no real peaks to be had. Maybe this was due to our missing egg white but we don't know for sure. We sifted in the remaining ingredients and hoped for the best. There was a good cake mixture texture to it so we just went with it. Into the tube pan and into the oven. Surprisingly and thankfully, it all came out alright. It rose as it was supposed to and smelled wonderful. We hung it upside down as suggested and went to bed. We both had nightmares about waking up to cake on the counter but it the morning, all was well. The next day was Dad's birthday. We went to work and then went over to our parent's house to celebrate. We were excited to show him what we made, but we also had a confession. It wasn't about the cake being short one egg white because that didn't seem to matter too much. We had to admit that we are cowards. We were afraid of getting the cake out of the pan. It's shameful, we know but the pressure had mounted and we didn't want it to all fall apart now. If we broke the cake, it would have been ruined as a birthday cake and we couldn't have that. So, as tacky as it was we gave our dad his cake...in the pan. We're not proud of it but he's the one with the homemade Angel Food Cake experience. At first, he couldn't get it out either. He cut a piece out, loosening it all and then shook the rest of it out. He happily ate that piece. It tasted great. The texture was perfect. We were happy. Dad said "You're sillier than you look" when he found out that we made the cake from scratch but we wouldn't have had it any other way. Lessons learned: 1)Get better at cracking and separating eggs. 2)Food made with love can withstand some small mistakes. You need to meet my friend, Shauna Sever. She also writes a baking blog: http://pieceofcakeblog.blogspot.com/ Tell her I sent you. I think you would love to exchange ideas, recipes, etc. Great job on the blog!